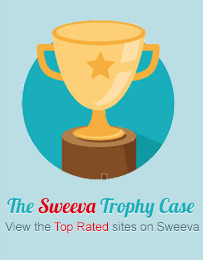 Sweeva contains links to outside sites and is not responsible for content on these sites. Use caution when entering any information into sites! Sweeva is not responsible for any lost credits, or any damages, loss of data, or other problems associated with using our services. Due to the nature of the internet and the free service being offered, Sweeva cannot verify advertised claims. Users of Sweeva should use caution before entering information or paying for services advertised. Sweeva recommends visiting FTC's Internet page and Consumer.gov to learn about the latest scams and ways to protect yourself. We run family friendly websites. Anyone found to be abusing other members, or creating an environment that is not family friendly will be terminated. Sweeva does not permit using the chat system for sending advertisements. Members found using these services to send spam, ask users to join programs, bait members into asking for more information, or in any way using these services for promotion may find their access to the chat revoked. Repeated offenses will result account suspension and/or permanent banning. - Sites can be removed for reasons not listed above if it negatively affects surfing. You are free to promote free co-ops / PTP's on one condition. You understand and agree that if we find multiple rotators being promoted inside your co-op link and / or it gets reported as an abusive site, it will be removed and all assigned credits will be lost. You may not sell traffic earned from surfing, contests, or given to you in any way free. You may re-sell purchased traffic ONLY in the form of a coop. You cannot reference Sweeva in your advertisements except when referencing a list of multiple traffic sources and there is no set number of hits coming from Sweeva. This includes incentives other than cash. You are responsible for cancelling your Paypal subscription should you be upgraded and no longer wish to be upgraded. We have a 7 days no questions asked policy on upgrades. If you purchase credits they cannot be refunded. If your site or account fails to follow any of the rules listed above, your account will be removed. All credits, impressions, or rewards of any kind will be lost. Your banners and urls will be removed, and your downline will be lost. Sweeva may change any of these rules at any time, with or without notification.